1) A robot recreates the walk of a 300-million-year-old animal. INFO: Researchers at EPFL and Humboldt-Universität zu Berlin developed a method of reproducing the gait of a 300 million year old animal based on fossil and fossilized footprints. 2) Intelligent Energy claims new endurance record for hydrogen-powered multicopters. INFO: Intelligent Energy created a coaxial multirotor powered by a fuel cell and a 6L tank of hydrogen compressed at 300 bars. The 70 minute flight test was performed and documented by Batcam, an UK based drone operating company. The video of the flight test has been recorded and can be seen at the bottom of the article. If you watch it in full please let us know! 3) Delivery Drones Use Bird-Inspired Legs to Jump Into the Air. INFO: Passerine, a South African startup is working on a fixed wing drone with feet that help the drone to launch and land vertically. The drone prototype is using blown wings (exhaust from the engine passes over the wings and portion of wing flaps). In the article you will find 3 videos of the prototype and an interview with Matthew Whalley, the CEO of Passerine. 4) Mapping “Camp Fire” with drones, lessons learnt. INFO: This report is a write up on lessons learned after mapping over 17,000 acres of land affect by California “Camp Fire”. 16 emergency responders performed 518 flights, producing 70,000 images. 5) Inside NVIDIA’s new robotics research lab. INFO: Recently NVIDIA has opened a new robotics laboratory in Seattle, US. The laboratory will be focused mainly on collaborative robots R&D. In the article you will find demonstrators on mobile manipulator in the kitchen, deep object pose estimation, tactile sensing and human-robot interaction. 6) NASA May Decide This Year to Land a Drone on Saturn’s Moon Titan. INFO: A Dragonfly mission could be launched in 2025 and arrive on Titan in 2034. The robot used in the mission is a multirotor aircraft powered by a nuclear power source. The main goal of the mission is to evaluate the organic compounds present on Titan. 7) Publication of the week - Line-of-sight guidance techniques for manned orbital rendezvous (1963). INFO: In the hopes that this work may in some way contribute to their exploration of space, this is dedicated to the crew members of this conuntry’s present and future manned space programs. If only I could join them in their exciting endeavors! - this is the dedication that can be found in this PhD thesis by Buzz Aldrin. 1) Drones Used to Find Toylike Butterfly Land Mines. INFO: Researchers at Binghamton University in New York are using thermal imagery captured by a multirotor UAV (Unmanned Aerial Vehicle) to search for landmines. In the trials the team was able to pick up about 78% of the mines. 2) Self-driving Rovers Tested in Mars Like Morocco. INFO: Recently self-driving space rover trials were concluded in Sahara desert by members of PERASPERA consortium. Before testing of the rovers the test location was mapped using a drone, producing a digital elevation model with a 4cm resolution that were used as a ground truth to the data captured by the rovers. The article mentions that SherpaTT rover managed a 1.3 km journey during trials. 3) Cafe Staffed by Robots Controlled by Paralyzed People. INFO: On November 26th a ribbon cutting ceremony was held at Dawn ver.β Cafe that was meant to be a trial run that lasted until 7th of December 2018. According to the linked article the Cafe used OriHime-D robots that paralyzed people could control from their homes. The project was crowdfunded and if the support continues it is hoped that the full fledged Dawn Cafe can open in 2020. 4) Autodrome: OpenAI Gym environment for self-driving vehicle development. INFO: The simulator is built around the engine, map editor and assets of Euro Truck Simulator 2 or American Truck Simulator. The project is released under MIT Licence. 5) The Disruptors Podcast Episode on Bio Inspired Robotics. INFO: In this podcast episode Prof. Auke Ijspeert from EPFL (Swiss Federal Institute of Technology in Lausanne) discussing biology vs mechanics. In the interview Prof. Ijspeert provides quite an interesting view on Boston Dynamics and Academia. Other topics covered in the Podcast are military use of robots, exoskeletons, Uncanny valley (including a robotic crocodille), robotics and jobs. INFO: Google is working on a 8x10mm radar chip for gesture detection. The radar operates at 60 GHz ISM band. According to the information on the website the SDK can provide data at 100 to 10,000 frames per second. 7) Publication of the week - Excalve: Hardware Testing in Mass Production, Made Easier (2018). INFO: This blog post about hardware testing is made of two parts. The first one talks about test jigs and automated hardware/firmware testing of electronics. The second part introduces Exclave - a factory test infrastructure written in Rust. We found the post to be very informative and full of good practices for electronics mass production. 1) Introducing the sponsored section. 2) Robotics for the Planet. INFO: Mat, the author of this newsletter partnered with 1% For The Planet, pledging to donate at least 1% of sales from his Robotics Consultancy and WeeklyRobotics to environmental non-profits. 3) Humble STEM Books Bundle - pay whar you want for STEM books (until 7th January 2019). INFO: The Humble Book Bundle with STEM books published by Mercury Learning is nearing to an end. In the Bundle you can find such books as Industrial Engineering Foundations, Artificial Intelligence and Problem Solving, Radar Systems and Radio Aids to Navigation, Industrial Automation and Robotics, Wireless Sensor Networks, Real-Time Embedded Components and Systems With Linux and RTOS and more. We joined Humble Bundle partner program, meaning that you can support Weekly Robotics by purchasing the bundle using the above link. 1) ATLAS (Various Countries and institutions) - Various PhD Positions Related To Surgical Robotics. INFO: ATLAS (AuTonomous intraLuminAl Surgery) is a project coordinated by the University of Leuven, is implemented by a consortium of seven Universities and many industrial partners. The call for some of the open positions will close on 15th of January. 2) Eco Robotix (Yverdon-les-Bains, Switzerland) - Various Positions. INFO: Eco Robotix creates completely autonomous robot for a more ecological and economical weeding of row crops, meadows and intercropping cultures. 3) Satellite Applications Catapult (Harwell, UK) - Agri-Tech Satellite Solutions Architect. INFO: The Satellite Applications Catapult aims to empower businesses in the exploitation of new and emerging satellite services, to achieve our own vision “To innovate for a better world powered by satellites”. 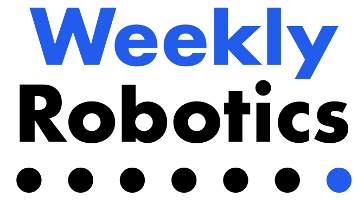 Welcome to the special edition of Weekly Robotics in which we cover what we think are the most important news and projects of 2018. We hope that you’ll enjoy this edition as much as every other issue of Weekly Robotics and we would also like to use this occasion to wish a happy new year to all our readers. 1) NASA’s JPL Open Source Rover project. INFO: This year we came across a fully documented Open Source Rover project from NASA that we mentioned in the issue #1. It’s also worth mentioning Sawppy rover which is a Rover inspired by the NASA’s project that is more cost-effective. INFO: One of the projects we liked the most this year is this ducted fan motor that was featured in the issue #4. The build log video featured with the project was especially fascinating and a good learning resource. INFO: Nybble is a quadruped cat project that was announced in October 2018. It could be a perfect first quadruped robot project. INFO: Another project that caught our attention is a low cost open source blimp flight controller. 5) Dexter - an open source 3D printed robot arm. INFO: The project that won a Hackaday 2018 prize. The robot has 5 degrees of freedom (DOF) with a maximum payload capacity of 1kg. The repeatability of the robot is said to be 0.05mm. INFO: This year we enjoyed learning about this Soft Robotics Jellyfish project. The above Hackaday post has you covered when it comes to follow up links with technical information and build logs. INFO: In the issue #8 we discovered a Soft Robotics Toolkit, a collection of free resources for design, fabrication, modeling, characterization, and control of soft robotic devices. INFO: In September we learned about this project allowing to turn soft objects into robots. INFO: In July we Disney shared information on robotics stunt man it has been working on. INFO: In October Boston Dynamics released the video of it’s bipedal robot Atlas doing Parkour that wen viral. INFO: Another viral video that we’ve seen a week later after Atlas Parkour was of Spot Mini dancing to Uptown Funk. 12) TU Delft Insect Robot. 13) Ion Drive fixed wing UAV. INFO: In November this year MIT Researchers announced the first flights with a fixed wing UAV powered by ionic wind. 14) Airbus Zephyr high altitude flight. INFO: In August Airbus Zephyr High Altitude Pseudo Satellite completed it’s record flight in which it staid in the air for almost 26 days. INFO: on 1st of October Microsoft announced an experimental release of ROS for Windows. INFO: In November Amazon announced AWS Robomaker - a service for development, test and deployment of robot software. The service is based on ROS Kinetic and some sources report that it will support ROS 2 in the near future. INFO: The ROSCON 2018 took place in September 2018. The linked page has links to all the talks from this event. It’s worth noting the amount of talks related to ROS 2. 18) Gatwick Airport disruption due to Drone sighting. INFO: A very unfortunate event for the Drone industry as a whole. Sources report that the disruption affected 1000 flights and over 140,000 passengers. Although it’s still too early to say what the incident will result in it’s almost certain that it will affect the drone industry in one way or another. 19) Uber self-driving crash resulting in fatality. INFO: An unfortunate event from March this year, where an Uber self-driving car struck and killed a Woman in Tempe, Arizona. The linked source is a preliminary report from NTSB (National Transportation Safety Board). 20) Fatal Tesla Autopilot crash. INFO: On 23rd of March 2018 a Tesla Model X, reportedly in Autopilot mode, crashed into a concrete barrier killing the driver. 21) Hayabusa Rovers asteroid hopping. INFO: In October this year two Rovers were deployed onto the surface of Ryugu comet. We included a link covering the technical information about those hopping rovers in the issue #7. 22) NASA Hubble telescope gyro recovery. INFO: In October NASA successfully recovered Hubble from a Gyro failure. The above page contains a good amount of technical details about the recovery process. INFO: This year we learned about Copenhagen Suborbitals, the amateur manned space program staffed by volunteers. INFO: On 12th of August a Parker Solar Probe was launched. The goal of the mission is to get as close as 3.8 million km from the sun surface, probing it’s atmosphere. 25) Rethink robotics close down. INFO: In the beginning of October we learned about Rethink Robotics closing down after rising $150M. 26) Alphabet to pull the plug on bipedal robot development. INFO: In November we learned about Alphabet dissolving Schaft, a developer of bipedal robots that Google acquired in 2013. 27) The hunt for Robot Unicorns. INFO: This article from September was very informative source of information about Robotics from the perspective of Venture-Capital. INFO: The above article from Robot Report lists Robotics companies that raised the most funding in 2018.